Salads are an easy way to get a lot of vitamins, minerals, and fiber into your ketogenic meal plan. Unfortunately many people get bored of them very quickly. The trick to making a salad that is truly exciting and you will continue to crave regularly isn’t necessarily about the low glycemic vegetables you use, but the salad dressing you top it with. This Asian style dressing recipe is sweet, tangy, spicy, and loaded with rich sesame flavor. Additionally, it can also be used as a marinade for your favorite protein and unlike bottled salad dressing that uses soybean and canola oil, this one is actually healthy. There are countless flavors and combination of ingredients that can easily be mixed in, so whether you are eating a salad as the main star or a side dish to your meal, you won’t ever be bored. Salad dressings are also a wonderful way to include fresh aromatic herbs and spices into your keto diet. Many of these very simple ingredients such as raw garlic are loaded with powerful health benefits and potent medicinal properties. Garlic has been widely studied for many cardiovascular and metabolic diseases. Many studies have shown that raw garlic has cardioprotective effects such as reducing plaque build up in your heart and slowing the progression of atherosclerosis. Polysulfides found in garlic cloves can also reduce blood pressure by widening blood vessels in your heart. One of the greatest benefits to adding raw garlic to your diet is its ability help boost your immune system. It is considered antimicrobial, antibacterial, and antifungal. It is highly effective in killing bugs that are responsible for many infections. Garlic cloves have also been shown to help relieve symptoms of the common cold as well. Garlic contains powerful sulfur compounds that can protect against organ and cellular damage cause by heavy metal toxicity. It helps support liver by gently chelating and excreting harmful metals from your body. Enjoy the all of the powerful health benefits and spice of the garlic cloves, zest of the rice vinegar, and salty bite from the low-sodium soy sauce in every single bite. 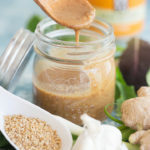 Regardless of this being used as a salad dressing or a marinade, one taste of this garlic sesame salad dressing and you may just want to drink it right from the bowl. Combine all ingredients in a small bowl, blender, or small food processor. Whisk well until smooth. Add water to thin for desired thinness. Add chopped green onions and toasted sesame seeds if desired. Top salad ingredients or use as a marinade for chicken. Easily turn this into a sesame ginger dressing simply by adding in freshly grated ginger root for an extra layer of flavor and even more health benefits.